Art has always been seen as a form of an expression. It is a unique way of sending a message or telling a story with a method that requires no words. DuDu, an alias used by an artist that has taken the Instagram art scene by storm with his ‘simple doodles’ at his account dududedoodle, believes in this and uses his concept of being a travelling artist that doodles wherever he goes to show his journey by the means of his intricate yet captivating drawings. His story began when he first doodled at a café three years ago with a cup of long black in front of him. Besides his passion for art, travelling has always an activity he enjoys. He defines himself as a fan of visiting various unique cafés, where he gets inspiration to doodle. 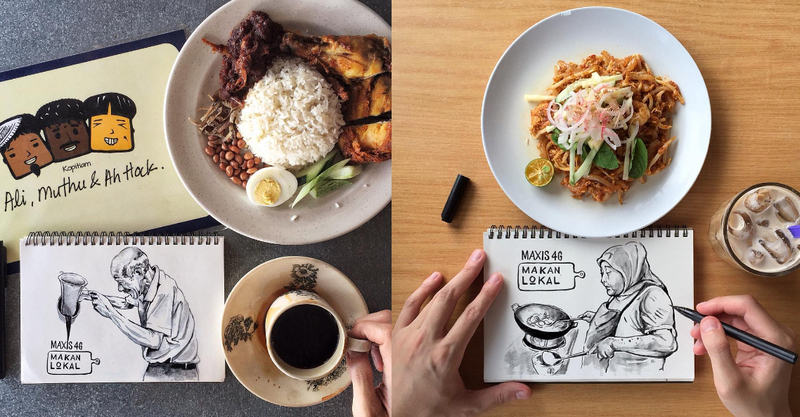 With over 18K followers on his Instagram account, DuDu admits he hadn’t really imagined how big his following would grow just from him sharing his doodles on the social media platform. He relates his popularity to his technique in producing quirky pieces where he plays with puns, shares meaningful content and interaction with cartoon characters. He often incorporates real objects into some of his pictures, making his doodles interact with cups, spoons, food and other items. His sketchpad may be one of his canvases but DuDu also enjoys using his surroundings to create his doodles as well. His forte is mainly portraits, as his master once told him that if he could perfect human features, everything else will be easy. Besides portraits, crossovers of different animation characters is another avenue he likes because he is able to put funny expressions and actions on them. Doodling may sound like a simple task but as with anything that requires creativity, there exist moments when it can prove to be quite difficult. DuDu agrees with this and he finds that his doodles only truly come to life depending on his mood on a particular day. His doodles can take up a few minutes of his time to an entire day. Another factor that comes to play when getting inspiration is the theme of the cafe he’s visiting. The rush of the caffeine he’s drinking and the ambiance of a café occasionally send a spark to ignite the creative flow of ideas for his doodles to begin to take form. He takes the time to analyse the café he’s in to relate it to his artwork and even incorporate some puns if possible. DuDu talks about how developing a distinct art style is all about studying from the greats and practicing. His own art style is influenced by renowned artists such as Hayao Miyazaki, a familiar name for fans of Studio Ghibli, and Kim Jung Gi who is a well-known travelling artist that hails from South Korea. “I adore Mr. Hayao Miyazaki’s persistence in hand-drawn animations, while I am fascinated by Mr. Kim Jung Gi’s ability to draw solely equipped with an ink brush and his wild imagination. I love that their passion for traditional hand-drawn arts resonates through their artful strokes,” said DuDu to Vulcan Post. Everyone has their own methods to de-stress, in more ways than one. DuDu shares his story when he had some unpleasant times in the past that led him to his goal of using his doodles to brighten up someone’s day, even if just by a little. “I was bullied and looked down upon by certain people and let’s just say it wasn’t a very nice feeling. Being in that place encouraged me to want to spread joy. Not many people realise this but there’s no better feeling than being able to make another person happy,” said DuDu. Another mission he has besides cheering people up with his artistic skill is encouraging local artists to go out and share their work with the world. Many may not see how people can be affected with just a simple image so he hopes that artists can come together to touch lives and create awareness for this beautiful craft. 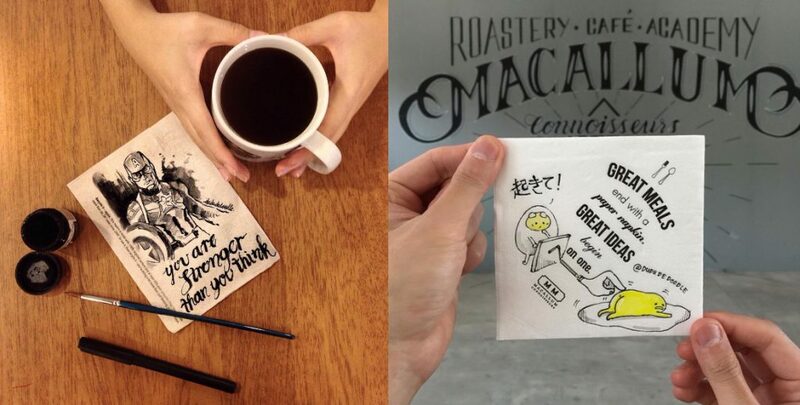 Being someone who draws to spread positivity, he has always gifted his doodles to those who greet him in cafés. Though most of his artwork comes free of charge, he participated in Comic Fiesta 2015 where some of his prints and original artwork were sold. 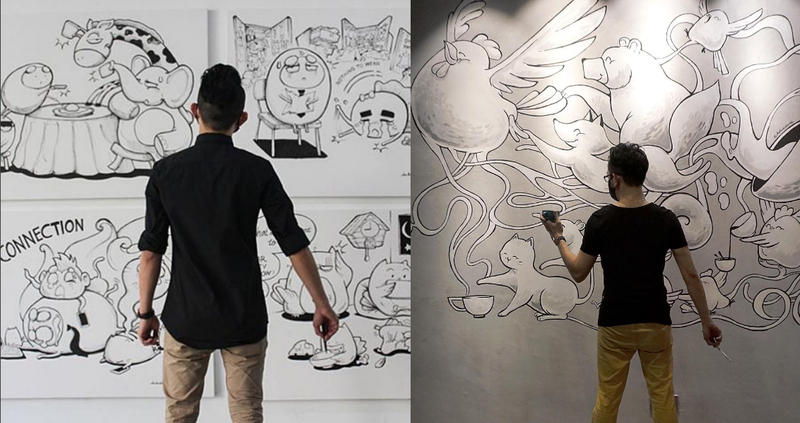 “Besides doodles, I have painted 8 pieces of murals in cafés and restaurants around the Klang Valley area. I’ve also been quite fortunate in that I’m able to collaborate with some big corporates, such as Shu Uemura Calligraph Ink Eyeliner, Maxis 4G Makan Lokal, Sarsi, and Singleton to name a few,” shared DuDu. When talking about what he sees in the near future, DuDu said he has plans to launch his first travelling sketchbook sometime in the future as well as collaborating with different brands that will allow him to reach out to more people and spread joy through his art.